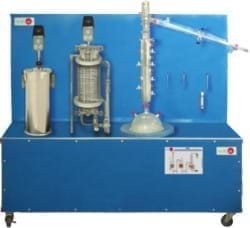 This unit has been designed to study and control the process of bioethanol. The system consists of three main parts: a mash unit, a fermentation unit and a distillation unit. Anodized aluminium structure and panels in painted steel. Main metallic elements in stainless steel. Diagram in the front panel with similar distribution to the elements in the real unit. Distillation column and sump heater. 2 pumps for delivering the mash. PID control of the temperature, cooling water flow, etc. All sensors, with their respective signals, are properly manipulated from -10V. to +10V computer output. during the whole process test procedure. moment during the process. Real time PID and on/off control for pumps, compressors, resistances, control valves, etc. time, of the three control constants (proportional, integral and derivative constants). Analog and digital PID control. Menu for PID and set point selection required in the whole work range. facilitate the teacher’s control on the student, and allowing the access at different work levels. of the unit, during the process, by using a projector.